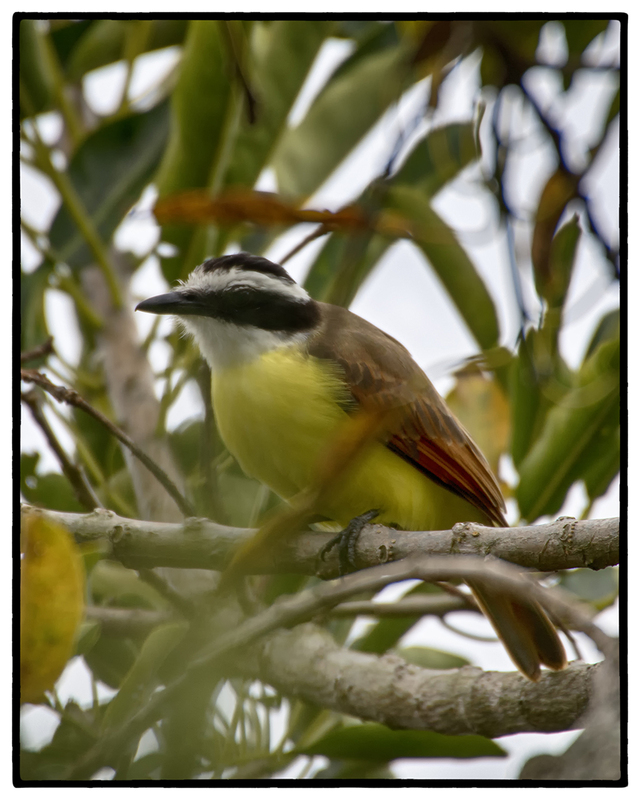 The Great Kiskadee, leader of the Dawn Chorus. Sitting in the tree outside my room in Costa Rica. I ♥ the DAWN CHORUS… An hour of the birds greeting a new day, joyous to have made it through another night. Singing to warm up, to establish territory. And then…an hour AFTER sunrise, a flurry of activity as they hunt for food, repair their nests and feed their chicks. Outside my room in Costa Rica at the Pura Vida Spa, the rooster crows at 4:45am. Morning arrives early here. The GREAT KISKADEE perches in a favorite spot with two females. Atop a tree similar to the Poincianas, balancing on a large seed pod, fighting for position with the RUDDY DOVE, who also covets this prime piece of real estate up above the treetops. The swallows glide through the air with such grace, their blue and white bodies flashing as they flit from side to side, over the rooftops and the trees. They are slower in the morning than they are in the afternoon, still it’s difficult to photograph them. Hummingbirds zip through the trees, a rate of speed so fast, one blink is all you get before they disappear into the thick blanket of forest tree leaves. Buzzing, chirping, wings flapping, calls, whistles. These are the sounds of the morning. The sounds of nature. The sounds of sun, sky and earth. The sounds of GLAD TIDINGS for a new day. What a great, creative post!